What Weight of Dumbbells Should You Buy? Here’s how you figure out what weight dumbbells you should buy. Beginners – Consider a 5-50lb dumbbell set. You can make use of the 5lb dumbbells for things like reverse flys or lateral raises where your muscles are not built up enough to lift the kind of heavier weight that you do while bench pressing. And if 50lb dumbbells seem like more than you’ll be lifting, you might be surprised how quickly you will work up to them for max attempts, and even go beyond. Intermediate Lifters – If you’ve already been lifting a bit and expect to do it a lot more, 50lb dumbbells are not going to be enough for you. Consider a 5-100lb set. You may not need the smaller sizes like 5lb, but again, the additional cost of them is so little it may not matter much. When deciding what weight dumbbells you should buy, consider also the type of dumbbells, because they come in different types of weights or are adjustable. Fixed Weight Dumbbells – These are your garden variety “hex” dumbbells that come in all kinds of sizes from 1lb to 100lb and sometimes higher. They aren’t adjustable. They are just solid dumbbells. The handles are steel, and the heads are iron, sometimes with a rubber coating to help reduce noise and protect the dumbbells. You will need a rack to hold all the dumbbells, assuming you won’t want them laying all over the floor waiting to be tripped over. Adjustable Dumbbell Handles – This is the economy version of adjustable dumbbells. Get standard or olympic handles, a bunch of plates, and you can load them up to at least 80lbs, depending on which ones you get. 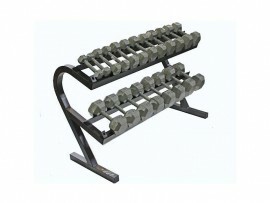 This is very cost effective, replacing a whole set up fixed dumbbells that take up more space. You’ll probably want a weight tree to store all your plates. Adjustable Dumbbells – Here are real adjustable dumbbells that don’t require you to buy bunch of plates. 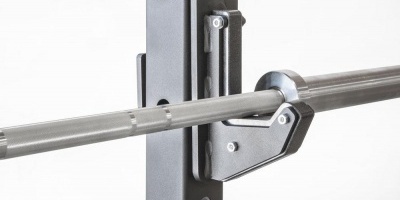 They’re a little more expensive but have a handy adjustment mechanism so you don’t have to worry about storing all the weight plates or having to spend all that extra time changing weights. These are made to be very quick, so you can do super sets and drop sets without ruining the routine by spending too much time changing the weight. Pro Style Dumbbells – A class of their own. If you’ve been to a commercial gym you’ve probably seen these. Round headed dumbbells that go all the way up to 150lbs or more. They are actually constructed similarly to adjustable dumbbell handles, above. They use a separate handle, but the handle of a pro style dumbbell is actually made to fit a specific number of plates, and then the end cap bolts on, so you’re left with a neat dumbbell where the end of the handle doesn’t jut out past the weights, and nothing will come loose assuming it’s properly tightened. Gyms love these because they can be repaired relatively cheaply if someone abuses them by dropping them, bending the handle, or manages to crack a plate. And they look professional and feel great.